Guachimontones stands out because it is the home of the circular stepped pyramids, which are unknown in other parts of Mesoamerica, and are perhaps unique in the world. The town’s name is Teuchitlan . The word Teuchitlán is derived from Teotzitlán or Teutzitlán, interpreted as "place dedicated to the divine", "place of the God, Tenoch" (Enoch) or "place dedicated to the revered God". Archaeologist are still trying to put together the formal story of the Teuchitlán tradition, but over the past 20 years much has been learned about the lost city of the strange round pyramids and the society that built it. 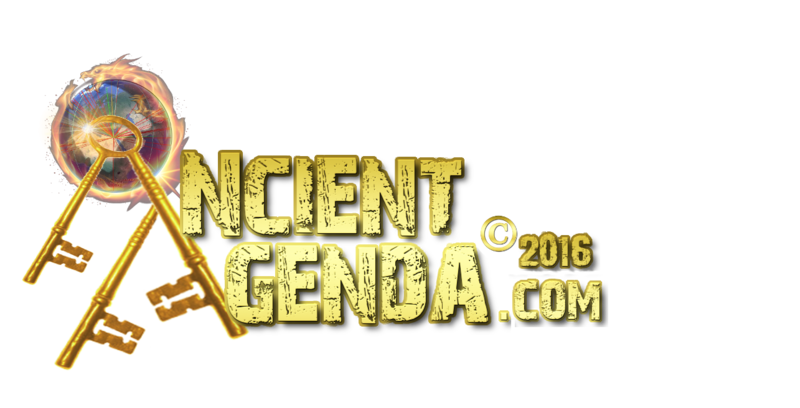 Occupation began around 300 BCE and may have lasted until about 400 AD. At its height, around 1,800 years ago, it most likely had a population of around 40,000 which made it a very important civic~ceremonial site in the region. 15 smaller satellite towns in the area have been identified from the air, exhibiting the characteristic circular architecture found here. Settlements from Guachimontones proper may have extended a full kilometer from the central part of the city, even going so far as Lake La Vega, where evidence of ancient chinampas, or floating gardens, has been found. The dominant features at Los Guachimontones are the circular stepped pyramids in the middle of circular building complexes. On the outer edge of the circles are the platforms. Circle 2 has 10 platforms surrounding it. 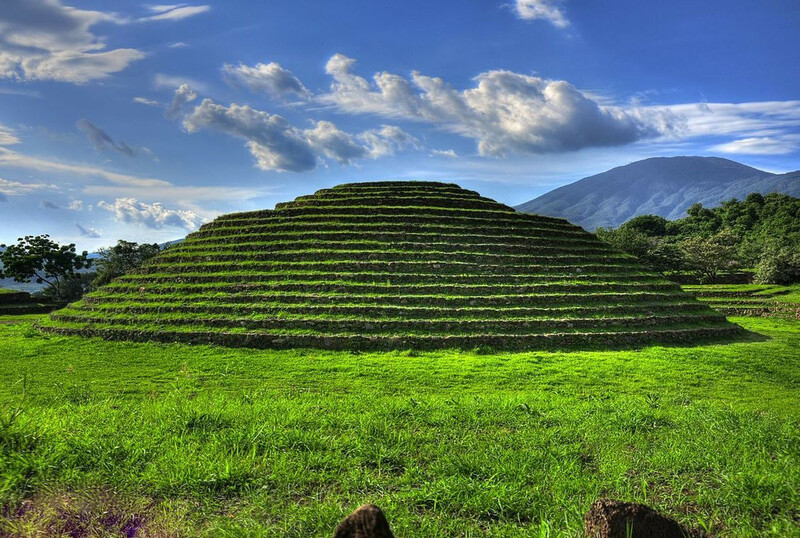 Circle 2 is the best preserved pyramid here and known as La Iguana. It is surrounded by10 platforms, three of them grouped together and all, including the pyramid, on a common base. It is 18.3 m or 60 ft high and when the platforms are included has an impressive 115 m or 377.3 ft (3+7+3=13) diameter with a perimeter of 360 m or 1181.2 ft. (1+1+8+1+2=13) It has 13 high step/platforms leading to an upper level, which was then topped with another 4 high step/platforms. 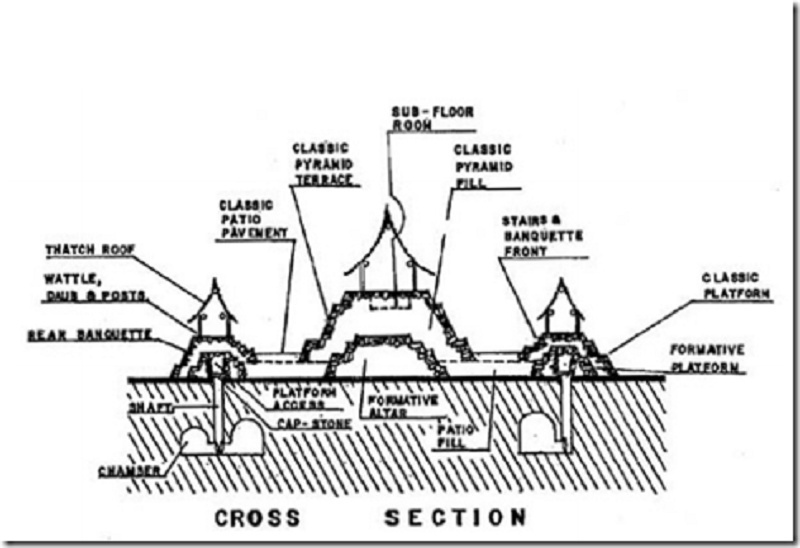 Stairways were originally at the four cardinal points of the circle going to the top platform. Circle 1, El Gran Guachi, is the largest circle but is still overgrown with trees. 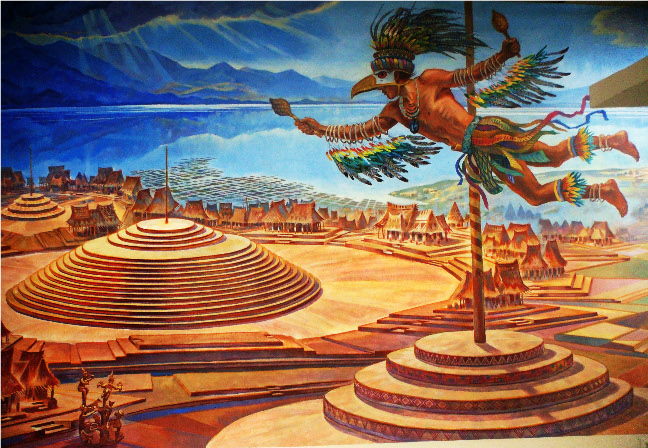 With it's platforms It has a diameter of 125 m or 409 ft. (4+9=13) A post was located at the very highest levels, and might have occasionally been used for Volador ceremonies. But while this pole may have been used for that there was likely another important purpose for it. 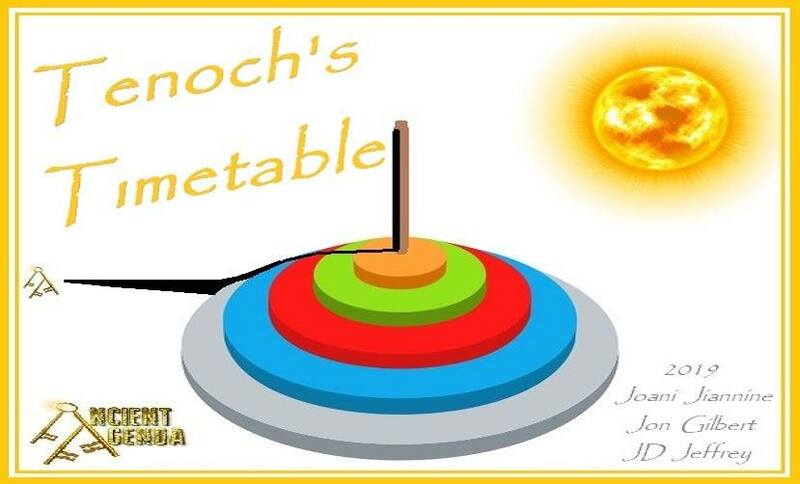 A Timetable keeping time? 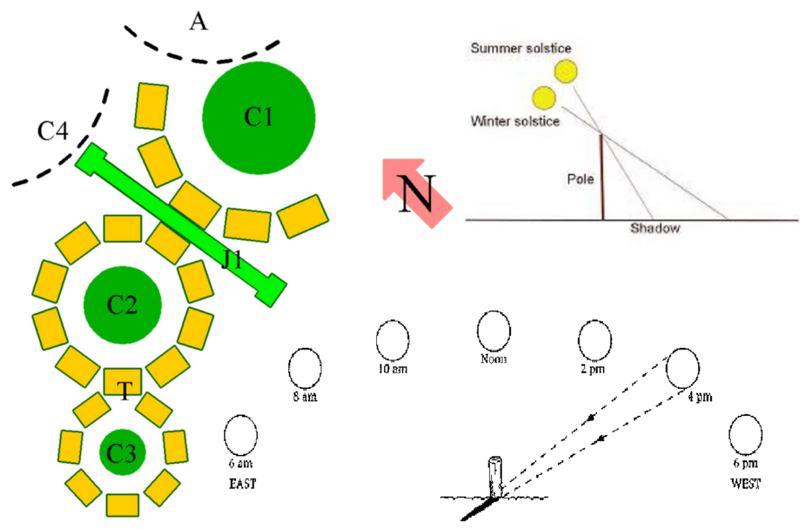 Circle 1 with it's pole and platforms would mark both the Summer solstice and the Winter solstice by the length of its shadow on those days, possibly using the inner edge of the platforms for Summer and the outer edge for Winter. Circle 2 (La Iguana) as a timekeeping clock for each day. As the sun moves during the course of the day the shadow would move along each platform marking the hours. At noon there would be no shadow. Above we show the hourly transition every 2 hours. To keep track of time, the Maya observed and recorded the yearly cycles of the Sun; including the times of equinoxes, solstices, and the zenith and nadir passages. Sunlight and shadows, as well as the position of the Sun during sunrise and sunset, are recorded in the architecture of the magnificent pyramids, palaces, and other structures of ancient Maya cities to this day. 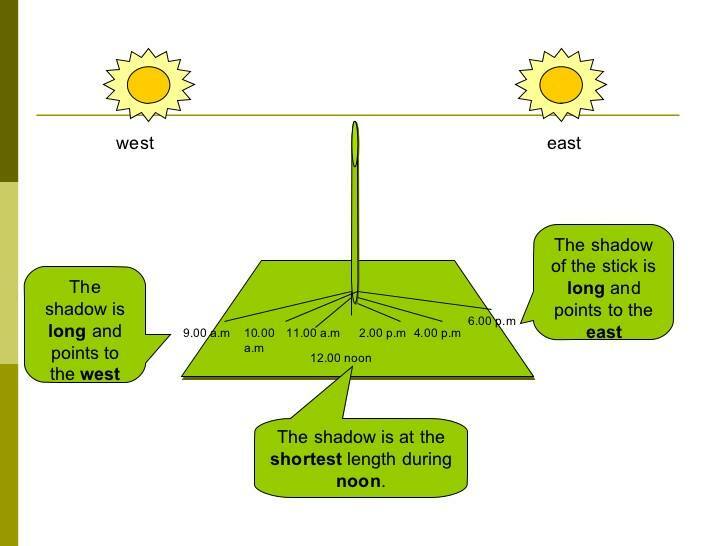 This diagram shows how the pole shadow would move along each platform in a circle from sunrise to sunset, marking the time, and the double line faces east. The platform entrances in the center of each, and the spaces in between, marked the sun's shadow as it transited from East to West everyday, the shadow changing somewhat with the seasons. The shadows from the sun would cascade down over the pyramid, reach the platforms and slowly move along them like the hands on a clock. They were used on a daily basis as a time keeper with the Sun's shadow. 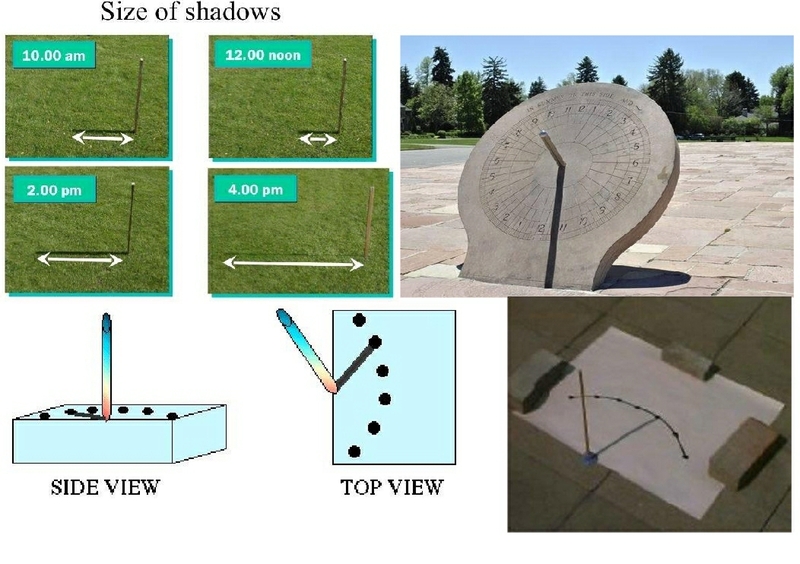 Sunlight and pole shadow transition, so very like a huge sundial. 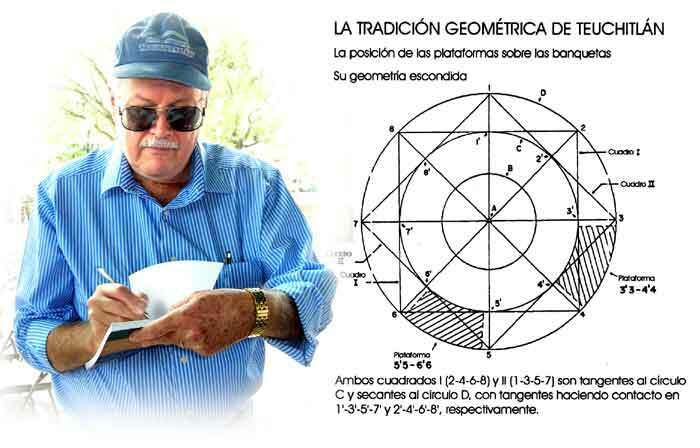 The Geometric Tradition of Teuchitlan shows a very advanced interesting math here because the position of the platforms with their sidewalks show a hidden geometry and appear to show an advanced knowledge of it.. The hidden geometry of the position of the platforms and their sidewalks. Both squares 1 (2-4-6-8 ) and 2 (1-3-5-7) with their lines to circle C, and lines to circle D make contact with points 1'-3'-5'-7'- and 2'-4'-6'-8', respectively. The 'Shooting Tombs' under the platforms are very similar to the Egyptian Mastabas. They are called 'shot' as they are entered by a single straight down deep shaft. They also had hand carved steps. The chambers below were all hand carved, and varied in height from 1 m or 3.28 ft (3+2+8=13) to 4 m or 13.1 ft, the 4 m ones being multiple burial rooms. They were accessed under the buildings on each platform. Relatives could climb down the shafts and visit their ancestors at any time, but more likely on special ceremonial days. The game would last from dawn to dusk, and was considered a way to solve any conflicts or disagreements. The ball had to be played with only the hip touching the ball, and if it touched any other part of the body the opposing team would get extra points. It was a space for the communities to get together, solve conflicts of interest and exchange goods. The 'Danza de Cadenas' or 'Chain Dance', is a ritual dance still in practice in some parts of Mexico at the time of the Spanish Conquest. The dance was usually comprised of men or women dancing as a group, arms interlocked and moving in a circular motion. This dance included hundreds of people locked in arms dancing in ritualistic fashion around the circular pyramids at Guachimontones. The Voladores Dance Ceremony. This dance is performed for thousands of tourists in Mexico today. Performers climb to the top of a tall pole, tether themselves to the top of the pole and then jump, flying around the pole in a circular motion. 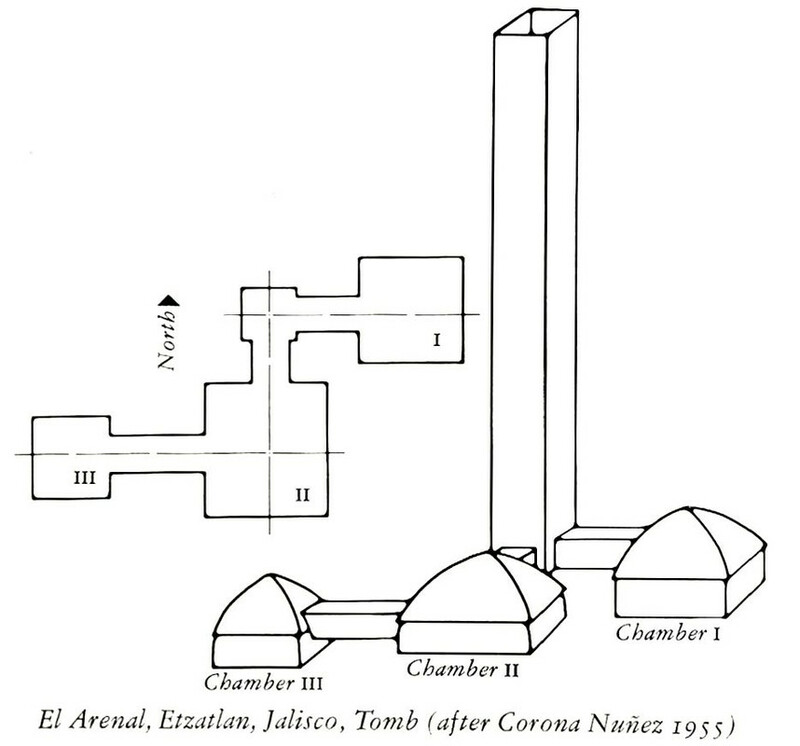 It’s clear that the flying rituals connected with the poles at the centers of the pyramids date back to the very early days of this city as excavations at the main pyramid at Guachimontones show a shaft for the Voladores pole in each of the 4 layers of the pyramid in each of the 4 stages of its building. 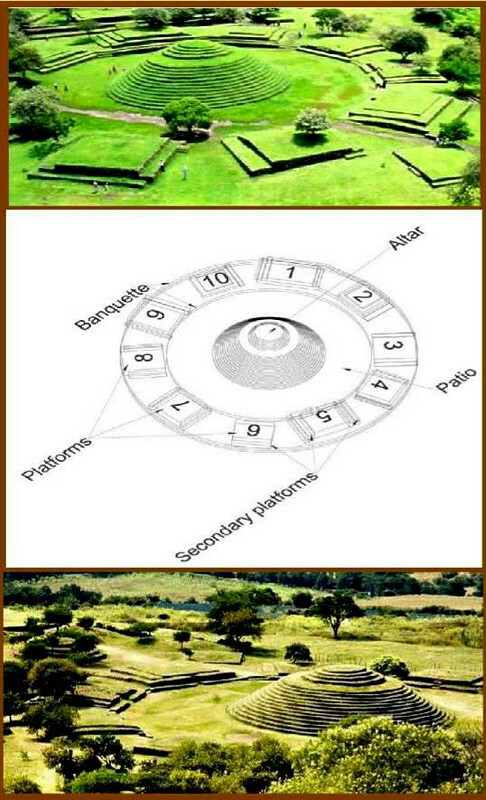 These unique circular step pyramids may also have supported small temples from time to time and many of the surfaces were decorated with geometrical designs or rudimentary pictographs. 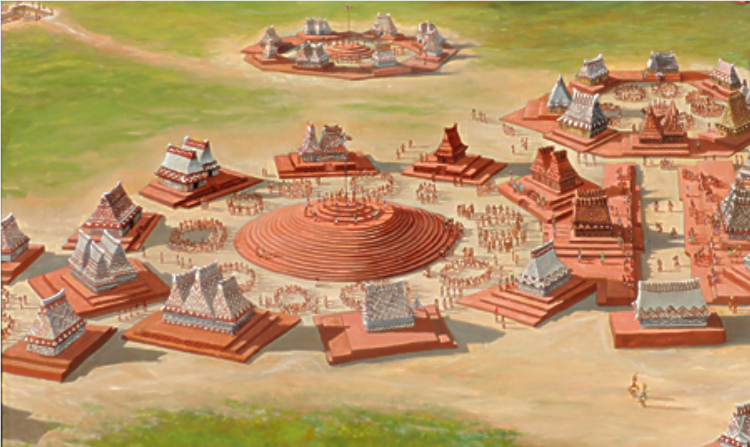 The circular pyramids, and many of the other larger structures in the city were finished with lime and painted an orange-red color. As at many other ruins sites in Latin America, appropriation of structural stones has occurred and Guachimontones has not been the exception. In the case of these ruins, they have suffered years of neglect and many site stones were appropriated in order to build streets and construct modern houses in the town of Teuchitlán.